Here’s what to expect and how to get ready for it. 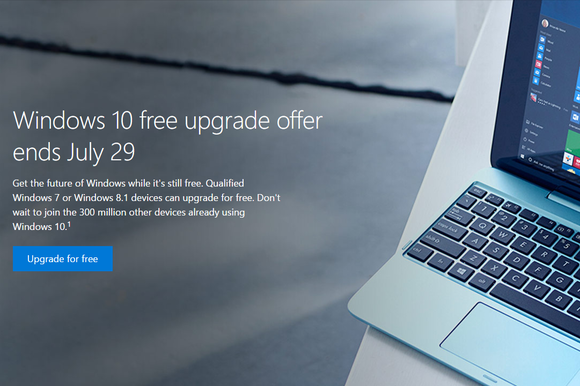 The Windows 10 free upgrade ends July 29. We’ve known that for a long time, but now the deadline is looming. You have just 31 days from today to do the deed. Or not. In the past month, Microsoft’s strategies for getting people to upgrade have swung from deceptive back to friendly, making it hard to know what the company will pull next as the pressure mounts. You see, Microsoft has a goal: It wants Windows 10 on 1 billion devices by 2018. It just hit 300 million in May, so there’s still a long way to go. Even if you’re turned off by Microsoft’s tactics, don’t endanger your PC by turning off updates. Microsoft has its own FAQ and advice pages for the upgrade, and we’ll be posting stories all month about managing the process and troubleshooting problems. Look for our Windows 10 banner to find all of our stories about the upgrade, the Anniversary Update (coming August 2!) and more. While it’s possible your older system could run Windows 10, it may not be pretty. Microsoft even has special error codes to signal when your system falls short of the requirements. For most people, however, the upgrade should go smoothly. Use these preparation tips to maximize your chances for success. Nothing ever goes wrong in an upgrade, right? Right. Microsoft has an entire page devoted to upgrade issues, and over the coming weeks we’ll alert you to the most common errors and problems and tell you what to do about them. One problem that might crop up immediately is a botched download—corrupted or missing files. We’ve looked into that and have some workarounds for you. Another unpleasant surprise would be running out of storage space for the installation process. We have some guidance for squeezing more capacity out of your drive. Welcome to Windows 10. Start off right by focusing on the most important things you can do in the first 30 minutes with your new operating system. We’ve even collected some of our favorite features that you’ll definitely want to try. Don’t worry if you get cold feet. You have 31 days after upgrading to roll back to your old operating system, and we can tell you exactly how that works. The free Windows 10 upgrade, and the Anniversary Update to follow, are big events for Windows users. We’ll keep you updated here with more news as these dates near. Tell us how the Windows 10 upgrade is going for you, or not, in the comments. Read the original article courtesy of PC World.